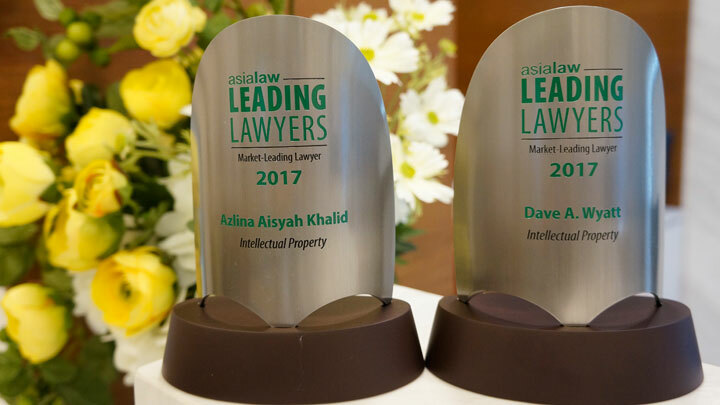 Henry Goh is proud to announce that our Executive Director and Head of Patents, Mr Dave Wyatt together with our Senior In House Legal Counsel, Ms Azlina Aisyah Khalid were recently listed as Malaysia’s Market Leading Lawyers in the 2017 edition of AsiaLaw Leading Lawyers – The Guide to Asia Pacific’s Leading Lawyers. AsiaLaw Leading Lawyers is the definitive guide to the top practitioners in 24 countries spanning across Asia for an array of diverse legal specialities that include amongst others, Banking & Finance, Capital Markets, Construction and Real Estate, Dispute Resolution as well as Intellectual Property. It is based on one of the largest surveys of legal professionals where In House Counsels, corporate executives and lawyers at the local, regional and international law firms participated in an online survey late last year. Nominations were then received for those individuals who excelled in their practice based on their work and reputation. Shortlisting of the nominees were then made by the Asialaw research team and thereafter finalized. Dave’s and Azlina’s recognition as market leading practitioners speaks well for their professionalism and underlines the Firm’s commitment to exceptional client service. We wish to extend our heartiest congratulations to both of them.